Once again for the holidays, I tried to make a pie crust and pumpkin pie. This time I was confident enough to go out on my own and tweak the recipes. Thanksgiving’s pie was good, but not amazing. I strive for amazing. My rule has always been to follow the recipe the first time, then change it the way you want after that. So, this time the crust came out better and thanks to a little mistake, the pumpkin pie filling was fabulous! Preparing the filling is easy. Just use the recipe on the side of the organic pumpkin can. (Not pumpkin pie filling, yuk!) But instead of evaporated milk, I used a can of sweetened condensed milk. Didn’t realize my mistake until it was mixed in, so we went with it and crossed our fingers. Added cinnamon, nutmeg, ginger, cloves, sugar and eggs (and a tsp of vanilla). Pour into cooled crust and bake 10 minutes at 450 and turn the oven down to 350 and bake another 30 minutes. There is no photo, the pie when that fast after dinner. Everyone devoured the pie and the crust, raving about how it was hard to tell that it was gluten-free. Always glad to hear that from the gluten eaters in the group. Little tweaks can sometimes be your best friend, dear chef! I’ve added a photo above of the beautiful cupcakes my daughter made for the day. 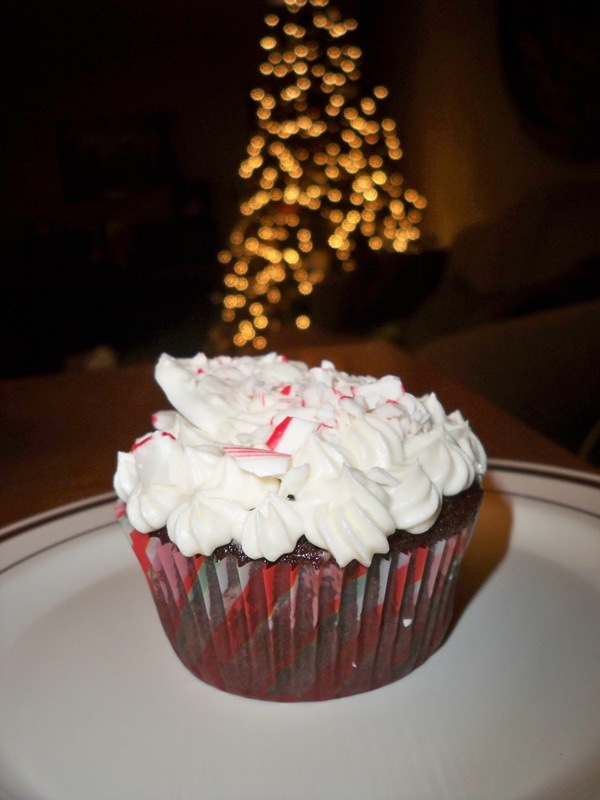 Gluten-free chocolate cupcakes with peppermint buttercream frosting and a white-chocolate/peppermint bark on top. Sweet! She’s getting to be the real baker, and may even be better than me now since she’s gotten so creative. So proud! Recipe to follow as soon as she gives it to me.